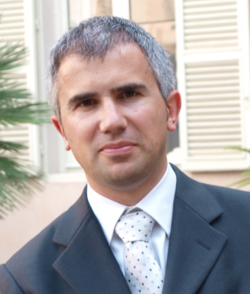 Expert System—founded by Stefano Spaggiari, Marco Varone, and Paolo Lombardi in 1989—offers its patented Cogito semantic technology for law enforcement and intelligence applications. An early customer was Microsoft, which licensed Expert System technology for its spelling checker in 1994. By 2003-2004, the company’s application of its technology to Telecom Italia telephone data generated considerable attention in the European Community. In 2009, Expert System opened an office in the United States to market the company’s platform to the US government and other organizations. Cogito exceeds the limits of conventional keyword technology and provides more effective management of the growing volume of information companies manage, turning it into accessible, usable knowledge across a number of languages, including Arabic and other Middle Eastern languages, English, German, and Italian, among others. Based on our research for CyberOSINT: Next Generation Information Access, Expert System is one of the leading semantic software provider and creator of the Cogito Intelligence Platform for Security and Intelligence. Cogito provides solutions for OSINT and COMINT and managing and extracting intelligence from structured and unstructured data. The Cogito Intelligence Platform is the Expert System suite that applies semantic technology to support analysts and knowledge workers in all phases of the intelligence cycle, enabling the discovery of information patterns and connections with an intuitive analysis dashboard. On March 23, I spoke with Maurizio Mencarini, Sales Director of Expert System’s Intelligence Division. After having assisted with the creation of the division itself, he contributed to the firm’s substantial growth in Italy and abroad, from 2005 to 2013. In 2015, after a distinguished experience in Accenture as Senior Manager, he has come back to Expert System to manage its expansion in the intelligence market. He has more than 15 years of experience, having worked for large companies like Siemens and Accenture. He has an Academic Degree in Aerospace Engineering and a Master Degree in Information Technology. Thank you for agreeing to speak with me. I want to start with a question about the Cogito technology. I know that you have patents which cover the systems and methods you and your colleagues have invented. Would you give me a bird’s eye view of what Cogito is? Of course, that is my favorite topic. Let me start by saying that Expert System has been developing and marketing software that understands the meaning of written language for more than 15 years. Based upon a patented technology that employs millions of definitions, concepts and relationships, our applications read and understand multiple languages the way people do. Would you give me a bit more detail? For example, our Cogito Intelligence Platform (CIP) is an integrated suite of components optimized to uncover, collect, process, and analyze Web-based text, including social media content, audio streams, and multimedia, among others. CIP can determine the sentiment of processed content in near-real time. What can the Cogito system detect? The system can detect asymmetric threats and identify abstract relationships in structured and unstructured information. The capability to understand, relate and disseminate intelligence as it is acquired can accelerate risk assessment of an emerging situation and contribute to the development of a threat profile. This capabilities is very important in many areas like, for example, Money laundering that it is not only about the financial transactions, it’s about abstract relationships connected by commerce and conducted by those who go to great lengths to appear completely legitimate. Obfuscating illegal conduct is intentional and is achieved in increasingly sophisticated ways. What’s included with a license for Cogito? Cogito includes optimized geographic content categorization tuned to intelligence and law enforcement requirements. The entity and relationship extraction is tuned to such concepts as world leaders, terrorist organizations, organized crime, and unconventional weapons. The name recognition subsystem handles normalization and automated identify matching. The platform includes a Cogito Intelligence API (application programming interface). Licensees can utilize the API with existing third-party or proprietary systems for analytics, visualizations, and report generation. The system makes use of linguistic rules, proprietary routines to analyze sentences, and a semantic network. The English language semantic network includes 350,000 words and more than 2.9 million relationships. What was the spark that ignited the rapid growth Expert System continues to enjoy? After 9-11 it became clear that the big problem of intelligence was not gathering info but understand and use effectively the information already available. As General Tony Zinni, former Commander-in-Chief, U.S. Central Command, said “80% of what I needed to know as Commander in Chief, I got from open sources rather than classified reporting. And within the remaining 20%, if I knew what to look for, I found another 16%. At the end of it all, classified intelligence provided me, at best, with 4% of my command knowledge”. Our software represents a significant step in sorting through the information coming from open sources, which you have discussed in your excellent report. To minimize the noise and extract what is really important, when it is important you need to analyze these data in a human like way. This is at the core of what we are committed to deliver to our customers worldwide. What are the points you emphasize to potential customers? In the cyber OSINT market Expert System is vertically focused. We provide the best possible solution to solve a fundamental problem, unstructured data management. When we talk to prospects we stress this aspect. Even in the Sony and Anthem matters the lesson learned is always the same: it could have been avoided, companies had been warned, but none “had seen” the right information. How has your product/service changed since you introduced it? The adoption of semantic technology, based on linguistic analysis, had sometimes scared customers in the past: they were hearing the message pushed by the “statistic based” companies that our approach was too complex, too long, too difficult to customize and maintain. 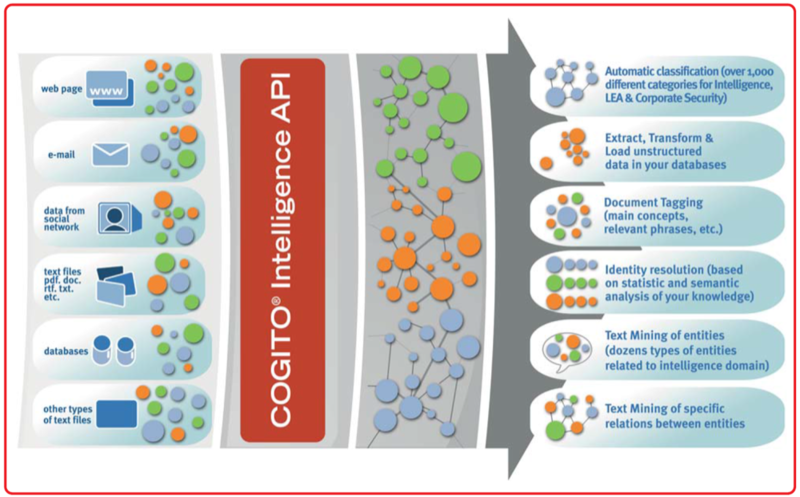 For this reason, to simplify adoption of our technology we have developed Cogito Intelligence API, an off-the-shelf, ready-to-install product providing full semantic processing features—text mining (with semantic reasoning and inferential entities) already customized for intelligence purposes: with 4 specific taxonomies (in over 1,000 different categories) for Intelligence, Cyber, Crime and Geographic domains and a domain ontology updated weekly represent the state of the art in the field. With this product, publically available at intelligenceapi.com we not only addressed their concern but we were able to win important deals even in partnership with other companies. What are the top three benefits you highlight for your customers? All our benefits are strictly related to effective information management. If you’re really able to understand all the unstructured information you can have access to, you can reduce many risks to an intelligence centric task. Our system delivers outputs and reports that can effectively support decision making. One of our clients in Eastern Europe tell us that their forensic crime work has been significantly enhanced with Cogito. Also, we know that our system improves operational efficiency in investigations and analytic work. As a result, many of our customers reduce the time and cost associated with investigations and case development. How can a financial institution like a commercial bank or a government accounting entity make use of Cogito? We already work with banks but unfortunately we cannot mention their name for obvious reasons. Their main use cases are around physical and human asset protection, supply chain risk management, compliance (specifically in the area of anti money laundering), and reputation management. How quickly can the Cogito system be deployed for a client? Cogito Intelligence API gives the customer the possibility to immediately adopt and take advantage of our technology. ballpark figure for your product? Most of our projects cost from five figures to six figures. We do prepare a custom price quotation for each of our engagements, and we do work with clients to provide the technology to match funding cycles and requirements. We’re the only company providing a multi-language, deep semantic (linguistic based) approach in text mining. on your firm’s product or service? Increasing availability of unstructured information, including data coming from social network and new communication tools, are pushing customers to look for solutions able to support them in search and analysis activities. What industry is seeing the most rapid adoption of this type of technology? We are seeing quite strong activity from the corporate Security departments in financial services firms, oil and gas companies, asset intensive sectors, law enforcement and intelligence agencies. Do you offer training and webinars? Yes, there are several webinar sessions available to those who want to learn more on semantic technology benefits, please visit the Expert System webinar information page. How does an interested party contact your firm? Expert System USA is headquartered in the Chicago area and we have offices in Europe (Italy, Spain and UK) and in other US geographies. Visit www.expertsystem.com for full contact details. Expert System software significantly reduces the complexity and labor intensity of processing text by transforming how technology understands content, and transforming the customer’s ability to organize, find and understand the meaning and importance of their information. The company’s core proposition is that semantic intelligence automates data interoperability and leads to a more efficient and effective information environment. Expert system’s Cogito Intelligence Platform (CIP) can identify terms, abbreviations, phrases, domains, meanings, concepts, and connections among these elements. The system supports semantic search and natural language search and includes administrative tools to develop and manage taxonomies and ontologies. The system automatically categorizes and creates data and metadata from the structured and unstructured content processed by the system. Organizations seeking next generation semantic technology will want to take a close look at the Expert System technology, Cogito, and the firm’s engineering consulting capabilities. The platform became available in 2010. See “Expert System’s Cogito Monitor Available as Semantic Platform” via www.sys-con.com. I want to buy licensed COGITO API for 3 months. Please guide the appropriate procedure for buying licensed version. Also provide the billing information.